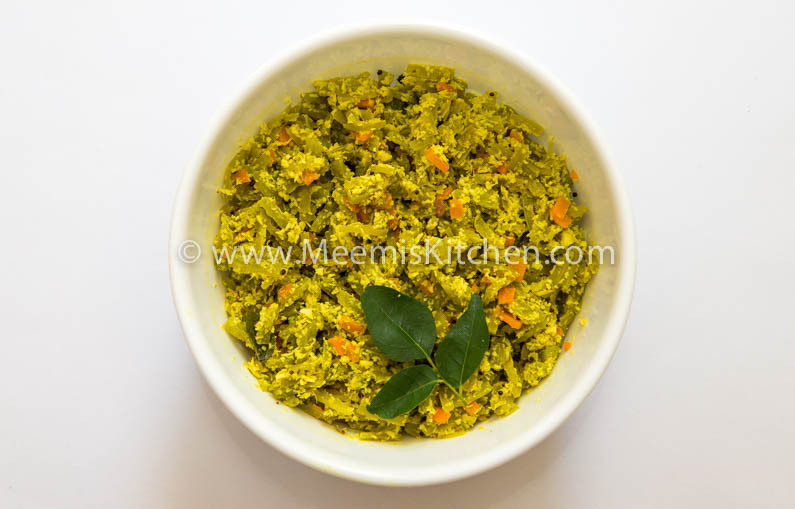 Padavalanga Carrot Thoran/ Snake Gourd Carrot mix thoran is a simple yet healthy side dish for Kerala meals. 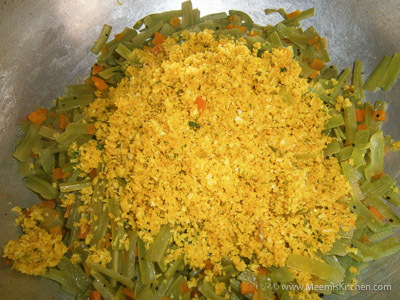 Thoran is a dish made with scraped coconut and vegetables. 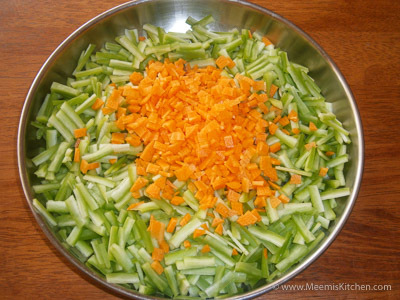 Some times, two or more vegetables are mixed to enhance the taste of the Thoran. Padavalanga and Carrot thoran is a delightful Mix thoran. 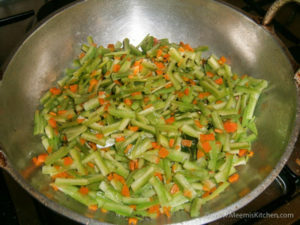 My mom is an expert in mixing veggies and making thorans, and Padavalanga Carrot Thoran is one of them. She adds carrot to cabbage, beans and Snake Gourd. Carrot adds color and appeal to the thoran and makes it easier for moms as most of the kids like carrot more than all other vegetables, and have it without fuss. When you buy Snake Gourd, always go for the soft ones. My mom used to buy long semi soft ones that are available in Kerala. I still remember carrying those from market as they won’t fit into baskets. In Bangalore, we get shorter ones mostly. Shorter or longer, you have to get the soft ones for tasty Snake Gourd thoran. 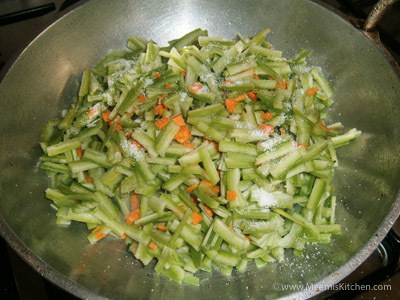 For Padavalanga Carrot Thoran, you need to cut it small and thin. You need to scrape the outer skin, the white/ Ash skin. Cut the edges, clean the inside and wash well. Then, cut into cylindrical tubes and slice it thin vertically. If you cut this way, the thoran would be perfect; as Padavalanga contains lot of water. So, try this Padavalanga Carrot thoran and enjoy with rice, Kerala Beef Fry or Beef and Kaya ularthiyathu, Kalan/ Pulissery/ pachadi, Fish curry, Potato mezhukkupuratti etc. 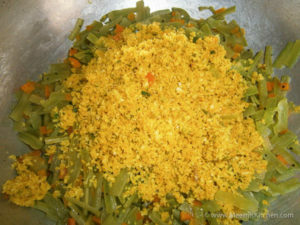 Cut Padavalanga and carrot into small pieces, heat oil, crackle mustards, curry leaves, add the padavalanga, carrot, salt, cover and cook for some time, stirring in between. 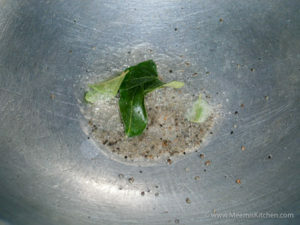 Grind coconut, onion, green chilli, curry leaves, turmeric powder coarsely and add. Cook covered for another minute, mix well. No water is required for Padavalanga, just stir in between. Health benefits of snake gourd include its ability to improve the strength of the immune system, reduce fevers, detoxify the body, improve the digestive processes of the body, increase hydration in the body, treat diabetes, boost the strength and quality of the hair, and aid in weight loss. I never knew that padavalanga..has so much health benefits.